Samberg has four points (1G, 3A) in his past four games to double his point total for the season. 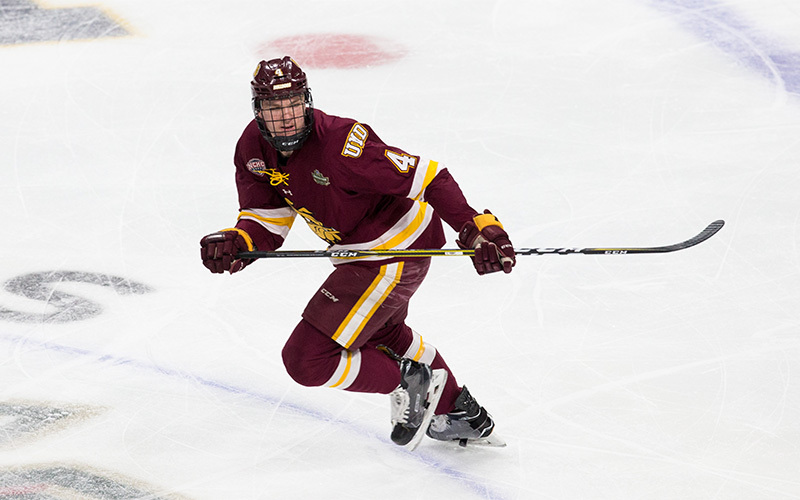 He had two points (1G, 1A) in a 7-2 win against Nebraska-Omaha on Jan. 25 in his last game of the month, as Minnesota-Duluth has won four games in a row. Samberg started the month by winning a silver medal while playing for USA at the World Junior Championship. He had two assists in seven games in the tournament. Smith had a point in his first six games of January, which was part of an 11-game point streak. He had eight points (6G, 2A) in eight games during the month. Smith had multi-point games on Jan. 12 against Madison (2G) in a 4-3 win and Jan. 25 against Sioux Falls (1G, 1A) in a 4-3 win. Smith leads the RoughRiders in scoring this season with 32 points (12G, 20A) in 36 games. He also has a team-best three game-winning goals. Wong scored in 10 of his 11 games in January, tallying 20 points (9G, 11A). He had six multi-point games, including four points (4A) in a 5-1 win against the Spruce Grove Saints on Jan. 4. He had two goals on Jan. 15 in a 4-3 win at Drumheller and Jan. 29 vs. Calgary Canucks in a 9-1 victory. Wong is second on his team and tied for ninth in league scoring with 55 points (26G, 29A) in 38 games. He’s also second in the league with nine game-winning goals.